The home of Mark Wills. Learn about the author, Rexford Rich, and his various book series here. Aside from being a book author, Rexford Rich is a software developer. Visit the Apps page to check out the apps he's developed. Rexford Rich is the author of several books series. Mark Wills is currently the only one available as of now. The series is entitled: The Adventures of Mark Wills. Please check it out at its own page: www.markwillsrr.com. Following that series will be: Worlds Collide, found at www.worldscolliderr.weebly.com. It will feature the two main characters from The Adventures of Mark Wills, and The Legacy of Derek Delvin. Even more to come: Swift, Planet X, Justice, Sudden Supers, Rebirth. Mark Wills begins his journey as a teenager and quickly learns how his life is not at all the way he expected it to be. He learns something about himself that was hidden from him. He learns what he will become; apparently, so has someone else. This person decides he wants Mark dead. Things quickly change in Mark's life, leaving him with no option but to go with it. This book series takes place after the two previous series: The Adventures of Mark Wills and The Legacy of Derek Delvin. Both characters are brought together, but not by pleasant means. Their worlds almost literally ... collide. Planet X is not a normal planet by any means. It is relatively close in size compared to Earth. It is governed by only one government. Laws are similar, just as are many things on Planet X. What makes it different are the people. At the age of twenty-one, every being is gifted with super abilities. A group of friends that once started as video game designers quickly change into superheroes. They become The Justice Alliance. They fight to become accepted in society, being paranormal and labeled as freaks. Subject to change: Some form of waves sweep through town, resulting in affecting certain people, gifting them super abilities. Suddenly people are making their powers known.Very soon, though, Ari realizes that this is not the first of super abilities. Some people have had their abilities for a long time. Bailey Palmer is a street racer, but not your average one, if there even are street racers to be considered average. He has a trick up his sleeve. This helps him significantly. He can't lose, nor has he ever lost a race. Emma was born blind, but after an accident she finds that she can see; though it is definitely not the same way as everyone else's way of "seeing". She now is able to see with her "mind's eye", so to speak. She now has to learn how to adapt to her new sense of sight. 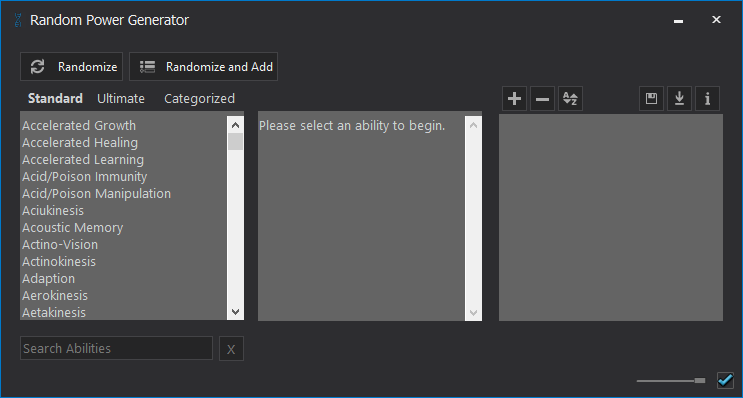 Rexford Rich is the creator of a program called Random Power Generator. It is a program that will randomly generate super abilities from pre-complied list for whatever purpose you desire. This App is available for both Desktop and Modern UI. Desktop versions include Standard and Modern UI.